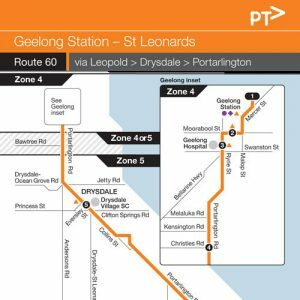 Route 60 travels between Geelong and St Leonards via Drysdale and Portarlington. Route 61 – Geelong to Drysdale via Leopold & Clifton Springs also services between Geelong and Drysdale via Leopold and Clifton Springs. Route 32 – Geelong to Leopold also services Leopold near Portarlington Rd. 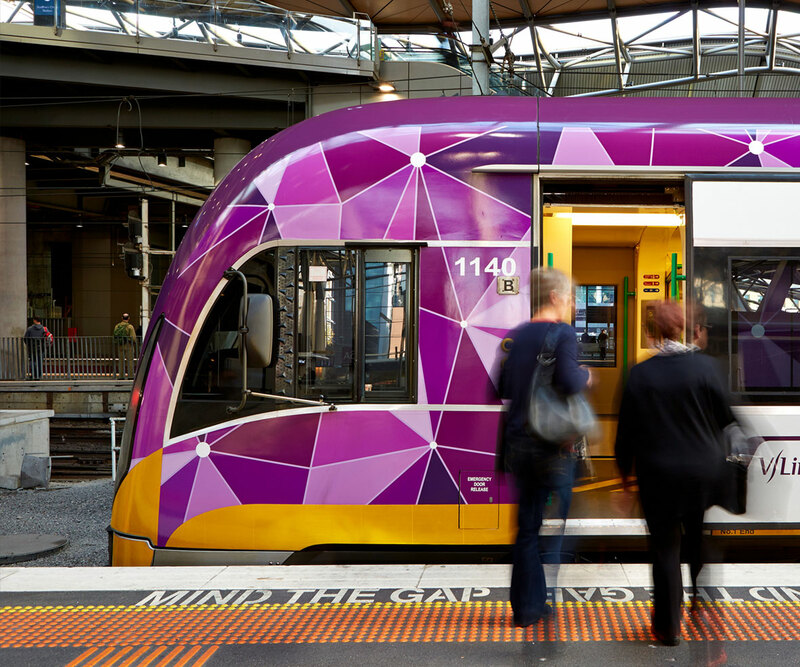 Departs from Geelong Station and travels via Railway Tce, Mercer St, Malop St, Moorabool St, Ryrie St, Drysdale Rd (Portarlington Rd), High St, Collins St, Portarlington Rd, Newcombe St, Fisher St, Stevens St, Gellibrand St, Newcombe St, Mercer St, The Esplanade, Hood Rd, Henderson St, Batman Rd, The Esplanade, Murradoc Rd (Drysdale-St Leonards Rd), Cole St, Seachange Way, Gilbert St to the terminus at the corner of Gilbert St,St Leonards. PLEASE NOTE: A number of services to St Leonards terminate after the St Leonards Loop (Gilbert St, Bluff Rd, Mainsail Dr, Sandbar St, Seachange Way) at the corner of Clyde Av and Seachange Way. Departs from Geelong Station and travels via Railway Tce, Mercer St, Malop St, Moorabool St, Ryrie St and Drysdale Rd to High St, Drysdale Village Shopping Centre. Departs from Drysdale Village SC and travels via High St, Collins St, Portarlington Rd, Newcombe St, Fisher St, Stevens St, Gellibrand St, Newcombe St, Mercer St, The Esplanade, Hood Rd, Henderson St, Batman Rd, The Esplanade, Murradoc Rd (Drysdale-St Leonards Rd), Cole St, Seachange Way, Gilbert St to the terminus at the corner of Bluff Rd, St Leonards. Departs the terminus in Gilbert St, at the corner of Bluff Rd, St Leonards, and runs via Bluff Rd, Mainsail Dr, Sandbar St, Seachange Way, Leviens Rd, Murradoc Rd (Drysdale-St Leonards Rd), The Esplanade, Batman Rd, Henderson St, Hood Rd, The Esplanade, Mercer St, Newcombe St, Gellibrand St, Stevens St, Fisher St, Newcombe St, Portarlington Rd, Collins St, High St. Drysdale Rd (Portarlington Rd), Ryrie St, Moorabool St, Malop St, Mercer St and Railway Tce to Geelong Station. NOTE: Weekday direct service from Drysdale to Geelong Station via Leopold: Departs Drysdale Village Shopping Centre and travel via High St, Drysdale Rd, Ryrie St, Moorabool St, Malop St, Mercer St, Railway Tce to Geelong Station. Departs from Drysdale Shopping Centre and travels via High St, Drysdale Rd, Ryrie St, Moorabool St, Malop St, Mercer St, Railway Tce to Geelong Station. Departs the terminus in Gilbert St, corner of Bluff Rd, St Leonards, and runs via Bluff Rd, Mainsail Dr, Sandbar St, Seachange Way, Leviens Rd, Murradoc Rd (Drysdale-St Leonards Rd), The Esplanade, Batman Rd, Henderson St, Hood Rd, The Esplanade, Mercer St, Newcombe St, Gellibrand St, Stevens St, Fisher St, Newcombe St, Portarlington Rd, Collins St and High St to the terminus at Drysdale Village SC. Most Route 60 Geelong to Drysdale weekday direct buses connect to Route 60A buses at Drysdale Village SC. You can change to a Route 60A bus at Drysdale to continue your journey towards St Leonards. All Route 60A buses towards Geelong Station connect to Route 60 weekday direct services at Drysdale Village SC. You can change to a Route 60 bus at Drysdale to continue your journey towards Geelong.